Light a Candle for Oakland! At Rebirth & Renewal 2015, we will create a Field of Resonance to bring healing to Oakland through the Power of Intention. The effect of mass prayer and meditation has been documented through studies in several major cities where the occurrence of violent crime decreased measurably in the presence of peace vigils. The late Dr. Masaru Emoto’s work observing the physical effect of words, prayers, music and environment on the crystalline structure of water demonstrated that human consciousness has a physical effect on the molecular structure of water… that polluted water could be cleaned through prayer and positive visualization. The streets of Oakland have been for too long polluted by violence, so we are inviting the Mayor, Police Commissioner, the City Council and the News Media to join us in sacred ritual to cleanse our City this Saturday at our closing ceremony. At 4:30 pm PST, Amelía Aeon Karris of KnowTheSelf.com will light a candle to open the field of resonance and invite those participating remotely to light a candle as well. She will then guide all those participating, in person, on the audio line, through the ether, locally and globally, in a meditation on healing, reconciliation and fellowship for Oakland. She will also invite participants to bring people and communities in need of healing into the field. Before the field of resonance, participants of Rebirth & Renewal 2015 will release 2014 and call forth their big dreams for 2015. Participate in person. Attend Rebirth & Renewal 2015. Purchase tickets on Eventbrite. Participate remotely with live audio feed. Tune into the conference call line at 4:25p on Saturday. Register for the Remote Field of Resonance (Live Audio Feed) on Eventbrite to get conference call number. Participate energetically. 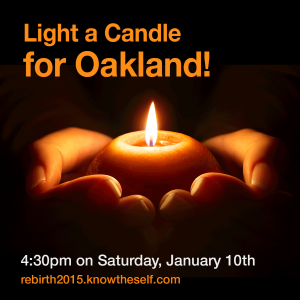 Light a candle for Oakland at 4:30p and meditate/pray for healing, reconciliation, and fellowship. Envision that for yourself, Oakland and your communities. Register for FREE for the Remote Field of Resonance (No Audio) on Eventbrite so we know you are out there. Visit http://rebirth2015.eventbrite.com for free registration to participate remotely in the field of resonance or purchase tickets for Rebirth & Renewal 2015.